Use with caution: Visible minority, high hyperactivity/inattention score; Recent immigrant, high emotional disorder-anxiety score; Recent immigrant, high hyperactivity/inattention score. High/low behaviour was determined by the 10th/90th percentile cutpoints (as appropriate).Physical aggression was defined as conduct disorder (i.e. violating the basic rights of others, disregarding age‑appropriate social norms) or physical aggression (e.g., kicking or hitting other children) for ages 4 to 5.Indirect aggression is defined as non‑physical behaviour to cause harm to others. It includes behaviours such as gossiping and social exclusion. *Visible Minority Status: This category includes persons who are non-Caucasian in race or non-white in colour and who do not report being Aboriginal. **Immigrant status: Immigrant refers to a person who is or has ever been a landed immigrant/permanent resident. This person has been granted the right to live in Canada permanently by immigration authorities. Some immigrants have resided in Canada for a number of years, while others have arrived recently. Some immigrants are Canadian citizens, while others are not. Recent immigrants are those who settled in Canada less than five years ago. ***Low Income Cut-off (LICO): an income threshold below which a family will likely devote a larger share of its income on the necessities of food, shelter and clothing than the average family. The approach is essentially to estimate an income threshold at which families are expected to spend 20 percentage points more than the average family on food, shelter and clothing. For details on how these scores are developed see The Survey of Young Canadians (SYC) http://www23.statcan.gc.ca/imdb/p2SV.pl?Function=getSurvey&SDDS=5179 -accessed June 22, 2017. 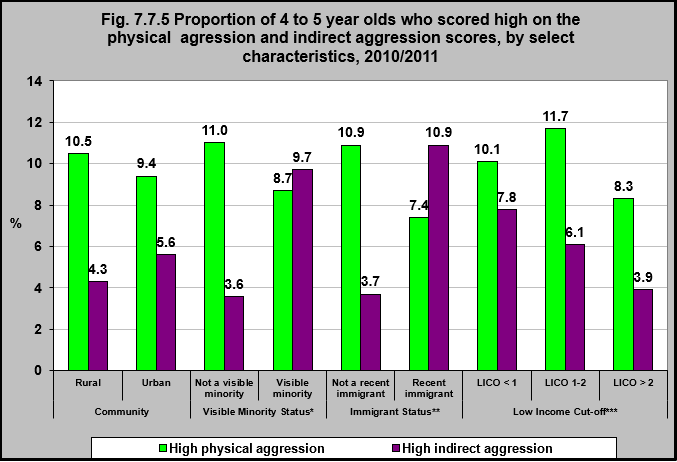 In 2010/11, children who were not from a visible minority group were more likely than were children from a visible minority group to score high on the physical aggression scale. In addition, children who were not recent immigrants were more likely than were children who were recent immigrants to score high on the physical aggression scale. Children who were in visible minority groups were more likely to score high on the indirect aggression scale than were those who were not in visible minority groups. In addition, children who were recent immigrants were more likely to score high on the indirect aggression scale than were those who were not recent immigrants.